Arlington Heights, IL gets all of its water from Lake Michigan, which is treated by the City of Evanston. The city changed from deep well water to Lake Michigan water back in 1985. The village does continue to maintain 6 deep wells for emergency purposes. Currently, Arlington Heights is working on the replacement of water related infrastructure, which includes both above and underground. This includes the painting of 10 water storage tanks, maintenance of water pumping stations, and the maintenance of the emergency wells. There are over 260 miles of water main of which 70 miles are over sixty years old. Issues such as failure of water mains, poor soil conditions, stray electrical current, and poor pipe quality are all of concern. The Public Works Department set a goal of replacing one mile of water main per year. Common issues with the drinking water in Arlington Heights are issues with taste and odor of the water. It is not uncommon for water to taste and smell like chlorine. The city attributes this to having too little chlorine in the water, which causes imbalances with the physical and chemical properties. Another symptom that is often discussed is a musty taste and odor in the drinking water. This has been attributed to the algae in Lake Michigan. When algae comes into contact with chlorine, it creates this objectionable taste and smell. Located in Cook and Lake Counties about 25 miles northwest of the Chicago Loop, the General Land Office began selling property in the Arlington Heights area around 1835. At that time, most of the purchasers were “Yankees.” Then, in 1853, an Oswego, NY native named William Dunton convinced the Illinois and Wisconsin Railroad to create a stop in the area – once the stop was created, Dunton worked to lay out a town in the surrounding area, properly named “Dunton.” By the time the area was established, the ethnic composition of the community had changed. While Yankees originally purchased land around Arlington Heights, it was now inhabited by many German farmers who had arrived during the 1840s. While the town was primarily producing crop vegetables and fruits, it was not long before the area expanded boasting a cheese factory, blacksmith, hotel, and hardware store. 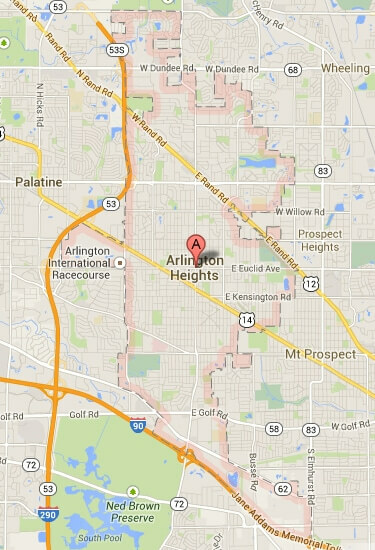 Arlington Heights was incorporated in 1887 with a population of 1,000 residents. In the 1850s, Arlington Heights established religious institutions that reflected the beliefs of its inhabitants. A Presbyterian church was erected first in 1856, followed by a Methodist church in 1858, and a German Lutheran church in 1860. A Catholic church was not established in the area until much later in 1905. At the turn of the century, Arlington Heights’ population grew to almost 1,500 residents and continued slow growth with greenhouses and farms popping up post–World War II. Arlington Heights experienced a great population increase during the 1950s and 60s when the expansion of Chicago (area economy and motor vehicle ownership were at their peak). These factors drove residents to the area in large numbers, resulting in annexations of surrounding land and a population increase to almost 65,000 by 1970. It was at this point that almost, if not all, the available land had been purchased and a continuous buildup continued to occur between Lake Michigan and the Fox River.